This Nintendo 64 Tron Skin is too cool for old school. Sadly I never play mine anymore, since the only games I’d still pick up on it would be ocarina of time or 007, and I can play OoT on other platforms, and I don’t typically play first person shooters anymore. That being said, it might totally be worth keeping it on display mine looked anything like this. 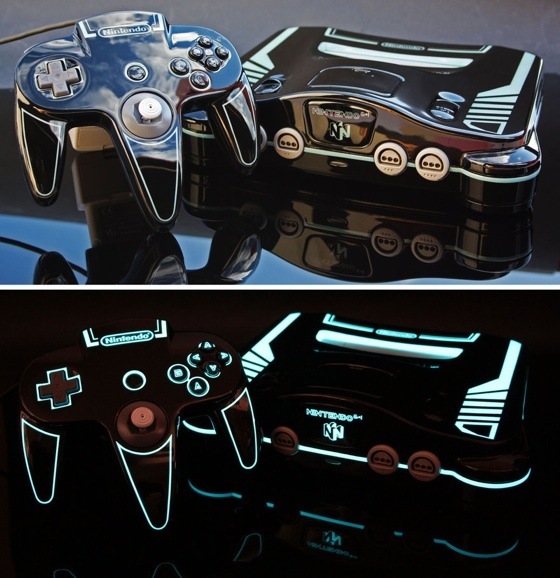 Check out this epic custom made Tron: Legacy inspired Nintendo 64! This thing is pretty damn slick-looking–both in the light and in the dark. It was created by Zoki64. Nintendo 64 was the last Nintendo system that I actually enjoyed playing. The Tron look just makes it so much more awesome.